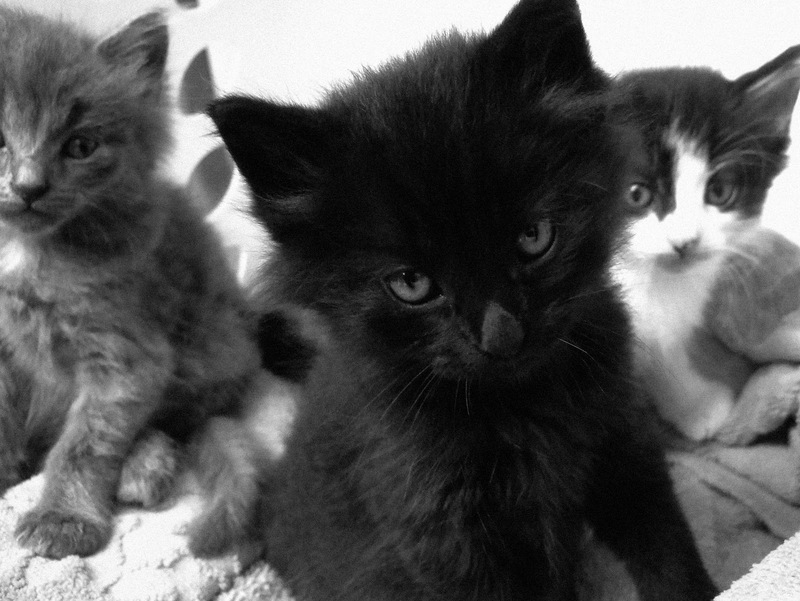 Three rescue kittens that I fostered a few years back. (left to right) Gracie, Georgia and Hilliary. In all, there were four sisters. The fourth sister, Dot, still resides with me. Their lives started out pretty rough, living outside, the litter of a feral queen-cat, they were brought in at five weeks; I kept them [housed, fed, cleaned, potty trained . . . ] for two weeks while I lined up a drop-off to a local adoption agency. The mother cat was then captured, spayed and, as that she is totally wild, re-released. If you have feral cats in your neighborhood, try to stop the reproduction cycle — capture, neuter and re-release. The point of re-releasing is two-fold. First, if they're not adoptable, they don't have them destroyed; a few feral cats in an urban neighborhood can help keep the vermin in check. Second, if you leave a void of feral cats in the neighborhood, it will most likely be filled with new feral cats that will need to be captured and neutered. To date, [with the help of a neighbor] I have captured, neutered and re-released every feral cat in my neighborhood [the ones we know about]. Since doing this, the local population has dropped substantually. An overpopulation of feral cats can be an ecological mini-disaster. Cats will kill anything they think they can eat and that includes the local lizard and bird populations; Even in an urban environment, birds and lizards are an important part of the landscape, eating insects that eat your garden. There may be a a veterinarian or PETA program in your town that donates their time for neutering feral cats. Look into it and stop your neighbors from being the scary cat people with four dozen cats.